So Saturday a few of the guys got together for some gaming. I took down some 40k and my trollbloods as different folks had different bits to play. I did get one 40k game in which I have some pictures and will do up a little report later this week. I also got three trollblood games. I didn't take pictures as I was pretty absorbed in trying to learn the game. There are plenty of things we've/I've done wrong so any kind of report is really not so helpful. The first game was 15 points against Anthony's Protectorate army. The next two games were against Jason's 25 pt Retribution and then his 25 pt Blindwater. Now for those of you who don't play yet or don't know the armies let me point a few things out for you. My army is a shooting army. That's how I've built it, and it (on paper) looks like it has some decent output. The Menoth Army casts a 'you can't target me with your guns' spell. The Retribution Army is basically all stealthed, meaning you can't shoot it from more than 5" away (more or less). And the Blindwater has abilities that can pretty much also always make them 'untargetable' by guns. So as you can imagine I was wooped pretty badly all three games. Sure I still learned the rules better and am 'thinking' more about how armies are put together. But overall I was disapointed. Not really because I lost, but because it was my first real taste that the game system isn't necessarily nirvana. The idea of 'just play the models you want' sounds great but if you do you'll certainly find plenty of bad matchups. Am I shocked necessarily, well no, I guess not. I can now see obvious flaws in both my current list, and truth be told I think with the warlock I've chosen. The problem my caster has is he really works well when you can get those 3 or 4 shooty beasts in there to take advantage of his synergies. However at small point games that doesn't leave a lot for other things, and if you think taking an all ranged army is going to work it just isn't. There appear to be plenty of things to keep multiple armies from being shot, pretty much at all. So what does this mean for me exactly? Well I'm trying to figure that out still. On the one hand I am really happy with the models I've painted, and I like what I've got in hand, but my motivation for painting is currently low. I think going to 35 points I can add in some tarpit unit, or a melee beatstick, or some much needed support. I think taking a look at my 25 point list I need to cut the bushwackers, and maybe the whelps, and also add some of the above. 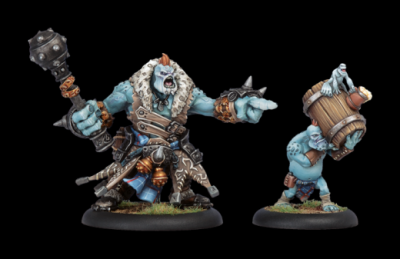 I think gunnbjorn at 15 pts is pretty much a big fat waste unless maybe your doing Tooth and Claw or another scenario type maybe. So even before this I had been thinking of picking up another caster. I was thinking Angus for awhile, but I think he might be my 3rd guy as he kind of blends shooty with CC. I think instead I'll just go Borka and build out a CC list. By the time I have that filled out picking up Grim will probably mean I've got plenty of options already in the toolbox. 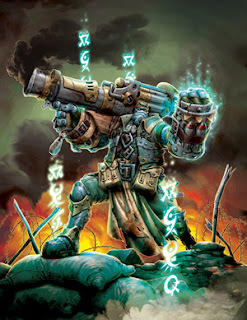 So some things I was thinking about for my gunnbjorn lists as options were as follows: Earthborn Dire Troll, Fennblades w/ UA, and the Kriel Stone Bearer with the Stone Scribe Elder. This will give me some options to 35, and quite honestly could take me up to 50 also. We're talking about a $100 investment, not so bad. So now taking a look at what I would have in the box I thought I'd take a look at what it would take to make a list for pimp daddy Borka. So wow, we're talking one $12 guy I'd need beyond Borka himself and my addons for the Gunny list. Sure, I could see how an Axer might fit better than the slag but I think this is still pretty workable. So what do I add to go to 35 points? So I beleive the Fennblades come in the box maxed, so we're talking another $12 for the Chronicler. So basically for about $50 I can make my toolbox now be a CC oriented army, assuming I was willing to spend that nex $100 to bump the list anyway to go to 35-50.